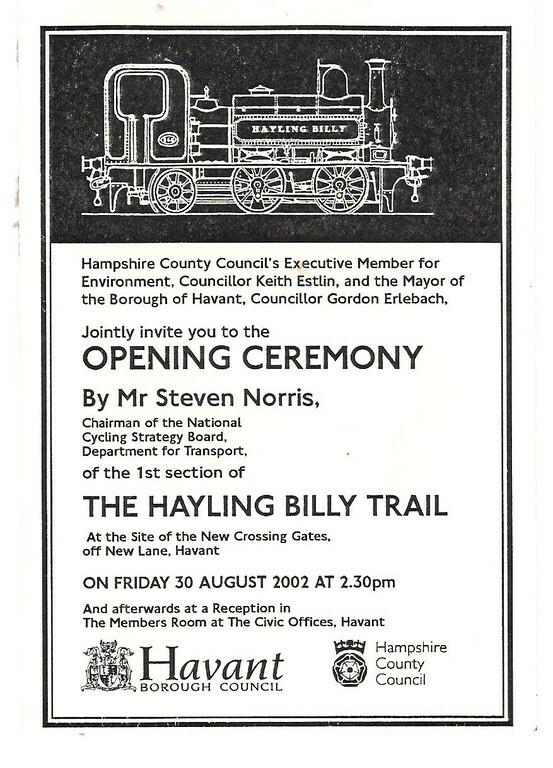 I have just found my 2002 invitation to the opening of the first (1.6km) section of the Hayling Billy Trail from New Lane Havant to Langstone Road. Councillor Gordon Erlebach, the Mayor of Havant and the Lady Mayoress attended., HBC’s project manager, Martyn Pettifer, gave a short speech and the trail was opened by Stephen Norris MP, Chairman of the National Cycling Strategy Board, who cut the ribbon and cycled down the new shared path with David Willetts MP. A crowd of walkers, cyclists and buggy users followed and there was a reception afterwards at the Civic Offices. The trail, which was provided by HBC, HCC, Sustrans and A&J Bull Ltd, will soon be ten years old and is very popular with all types of users. Of course we now have two more sections on the west side of Langstone Road and a small extension should take the cycle/pedestrian path as far as the sailing club entrance if planning approval is granted in the near future.